(a) Stationery, especially journals. I buy a lot of beautiful journals. (b) Resolutions, especially those starting at the beginning of a month, a season or – best of all – the year. (c) Self help books that aren’t American – I’ve found the Japanese ones, like The Courage to be Disliked by Fumitake Koga and Ichiro Kishimi, especially interesting. These all came together in L’arte de la Liste by Dominique Loreau. Yes, obviously she’s French, but she’s lived in Japan since the 1970s, and so this book is much influenced by Japanese ideas. 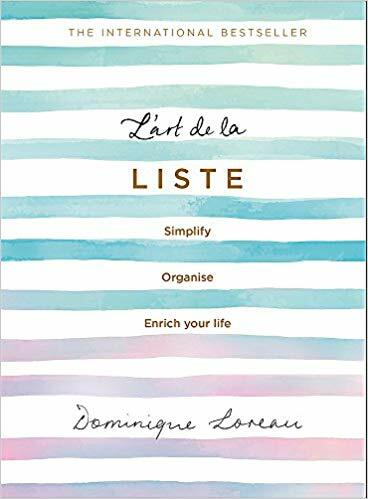 Though the cover promises that you can simplify and organise, it’s not a how-to in any narrow sense. It really is about enriching one’s life rather than bullet points and binders with ten tabs and ruthless efficiency. I have re-purposed a lovely, flowery but totally failed “Write Two Pages Every Single Day for a Month” journal (I managed three non-consecutive days!) and it’s now “A List a Day for a Month” lovely flowery journal. A list just has to have more than one item on it. That’s all! My list for today is TEN REASONS TO BE CHEERFUL. 1. Victorian voters have rejected the Liberal Party. Maybe the whole lot of them will have a good, hard look at themselves. Or maybe not. 3. 200 of the striking school children came from my town, Castlemaine. 4. Gorgeous little silver eyes are hopping around the the tree outside my window. 5. My husband had a crack at making hummus for the first time, and it was delicious. 6. There are bright pink, pale pink, red, scarlet and red-and-white geraniums all in flower in the front garden. 7. My glasses weren’t lost, after all. 8. My son assisted a group called Democracy in Colour , which is a movement of people of colour and allies working together to tackle structural racism during the state elections. 9. One customer has bought six copies of my book to give to friends, and sent me a beautiful card telling me why. 10. And – sorry to keep banging on about politics – I was able to vote without fear, harassment or intimidation, unlike far too much of the world; there was no voter suppression or totally outrageous gerrymandering as in the USA; the election was on a Saturday, but if I hadn’t been able to get to the polling booth, I could have voted by post: I voted at my local school, and there was a sausage sizzle. If I didn’t want to vote, but also didn’t want to cop a fine, I could have drawn a picture or left it blank. How lucky are we.